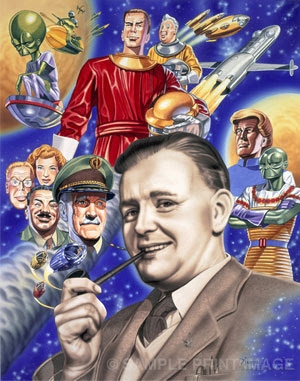 Doctor Who and Dan Dare illustrator Andrew Skilleter is the focus of a 15-page, full colour, highly illustrated, wide ranging interview covering highlights of his career, in the August edition of Book & Magazine Collector, a glossy pocket size monthly magazine, on sale now. Copies are available from most good sized W H Smiths (and some other newsagents), usually under a section like special interests/ collecting. As downthetubes reported last month on the main site, Andrew recently released a new print celebrating the work of Dan Dare creator Frank Hampson. • Andrew's official we site, www.andrewskilleter.com is under construction and he tells us he hopes to have it online for August.